The parents of Scott Sexton are suing pharmaceutical producer Eli Lilly saying that Zyprexa, a commonly prescribed psychiatric drug caused their son to fall ill with pancreatitis and die, reports the South East Texas Record. According to a reader who commented on this earlier article on my site, Zyprexa is only approved for a rather small population of ill people, yet it is the 7th best selling drug world wide. Image: Electronic Frontier Foundation - Eli Lilly Zyprexa Litigation. Pharmaceutical whistle blowers have accused Eli Lilly to push Zyprexa for unapproved uses, a practice often called "off label" prescription. Medical doctors can use a drug for patients even if their illness is not what the drug was originally approved for. Much of the kickbacks to medical doctors are made to influence their prescribing habits, to recommend these best selling drugs to as many of their patients as possible, regardless of effectiveness or dangers. There is even a "medical algorithm project" designed to push the most expensive psychiatric drugs on school children regardless of their effectiveness, complete with a mandatory mental health screening program to catch school kids and students who even remotely could be said to be "in need of " medication and to put them on these drugs. The report in the South East Texas Record - Zyprexa blamed for son's death, parents sue is commented by the Alliance for Human Research Protection's Vera Hassner Sharav. The FDA seems to be part of the problem, rather than the solution. "Eli Lilly and Company was aware of the increased risks created by Zyprexa, and concealed information about these risks from prescribing physicians and from the public." That is the charge of a lawsuit filed in Texas by the parents of Scott Sexton who was prescribed Zyprexa for an unspecified "mental disorder," developed pancreatitis and died. Mr. Sexton was a talented professional young man (with a Masters in Business Administration, working for one of the large accounting firms). The lawsuit charges Eli Lilly with of "acting with negligence and gross negligence and faults the company with product liability, misrepresentation, fraud, breach of continuing duty to warn and breach of express warranties." 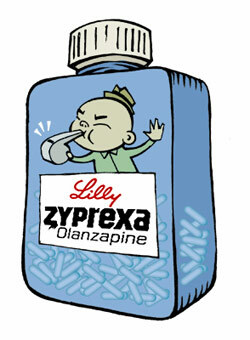 The suit notes: "Zyprexa has been widely advertised as a safe and effective anti-psychotic medication. In reality, Zyprexa causes serious adverse health effects including pancreatitis." We have come to realize that the drug-induced epidemic of severe adverse drug events produced by FDA-approved drugs will be sharply curtailed when doctors who unknowingly prescribe defective drugs resulting in harm, will sue the manufacturers for concealing vital drug safety information. The FDA under its current administration can be counted on adding to the carnage triggered by toxic drugs such as Zyprexa and the other antipsychotic drugs in its class-e.g., Risperdal, Abilify, Seroquel, Geodon. Indeed, the FDA has embarked on its most reckless back-door approval policy that will expand rather than curtail the misuse of these drugs in children. This week FDA issued the government seal of approval--which was supposed to be restricted for drugs PROVEN safe and effective - to Johnson & Johnson's toxic antipsychotic, Risperdal. Hi. Can I have the name of a good Lawyer. (one who Sued eli-Lilly) I developed gallstones after taking Zyprexa.